Skyscript.co.uk :: View topic - Will I work here? Posted: Sun Feb 11, 2018 3:59 pm Post subject: Will I work here? There is an applying aspect between me and employer as well as an applying aspect between employer and internal candidate but the employer apply's earlier to the internal candidate, AND Employer is in the 7th house. I don't think this goes my way. I don't treat electional charts like a horary. Gemini rising and Mercury conjunct the 3rd house ruler is fitting for the subject matter but doesn't necessarily represent you, nor the Moon, but more so the event itself. The Moon is not placed well and the ASC ruler is combust a detrimented planet and also the south node, which is a placement that decreases the energy of a planet (that is good for a malefic but not really for Mercury). This does not mean the interview will go terribly but there might be some communication problems or delays or issues with paper work. With Venus very well placed and Moon sextile Jupiter, there are some positive influences on the time. The main issue I see is Saturn in the 7th. This could mean a more stressful interview with people who have high expectations and are critical and judgmental. I often get Saturn in the ascendant in job interviews but always get job offers. The ascendant is not necessarily me but I am very Saturnine, so I do think it represents what I bring to the interview. I am serious, fairly short in what I say and am more critical of the job than i am of myself being interviewed - I am interviewing them too. I have Moon square Saturn and many people find me cold and nonexpressive. So I sort of see that energy the way I see myself and I know from experience that it can be an offputting energy. If someone or the group makes you feel this way, don't assume they don't like you, though. They are just being careful of their choices. I think this might especially be true with the Moon in a sign of Saturn. Another thing to consider is your own transits and influences. I weigh that with the election charts. Election charts are not always very representative of what happens. I often look at charts for exam times for grad school and the ones I think are terrible often still end up with me having excellent scores, but that has more to do with my own chart than the electional chart, which might show a more difficult exam but doesn't mean I will fail it. I am not sure you have concluded anything and would like to know if you have answered the main question is this my next employer? As I said, election charts are not horary and a simple yes or no is more complicated than looking at significators. 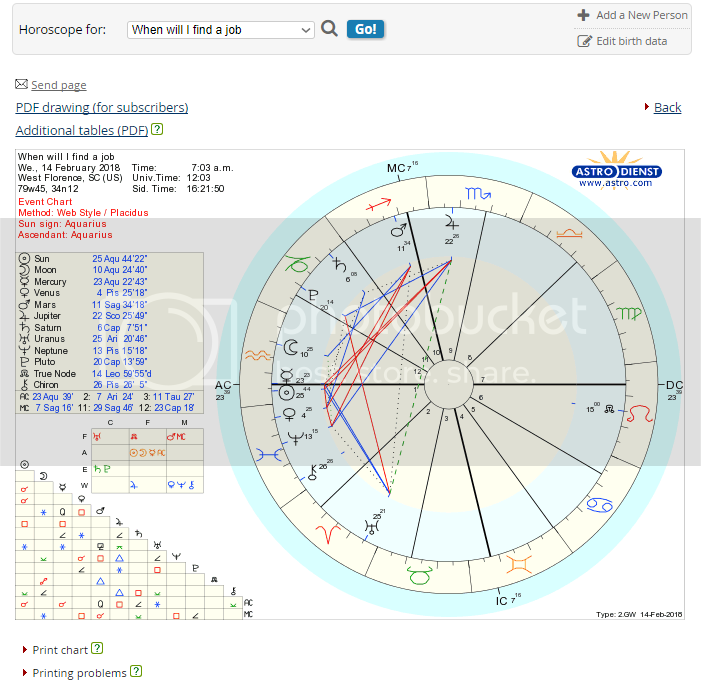 I would analyze the person's transits and profections with this to see if the candidate would be at their best but even then the chart is not a horary. This chart only paints a picture of the energy around the event and is not as straight forward as a horary. If you assume the Moon and Mercury are you and the job Jupiter, you can come to the wrong conclusion just based on that. However, you can get the idea of the overall tone of the event, such as this one having Saturn on an angle, Mercury combust, Moon in Capricorn, Venus on an angle, etc - these might help describe what is experienced between parties during the event. Election charts are more so used to pick the best time for something to occur. You sound like you have no choice so I am not sure why I see the point of looking at this. Would I select a time where the Moon is waning and is in the 8th in a sign of Saturn and the ascendant ruler/subject matter here (Mercury) combust and conjunct the south node ? No. Maybe if I wanted to undergo something that involved getting rid of something, since these influences are not suggestive of increase but of decrease. Do I think the event might be cancelled/rescheduled or delayed? It would have a higher probability due to the combustion, but I can't say for sure, and I can't even really tell if this time is good for you because I don't know anything about your own influences. It would be terrible for me, but I have no idea what is going on in your chart. I think in general the chart is not a favorable time for an interview but that doesn't mean you will not get the job, since a job offer has more to do with the process than just an interview and the energy around that time. You said you already had a phone interview, so why would you think the time for the next interview would tell you if you got a job, since these are two factors that combine, along with the application, which was submitted at a different time (and was actually the initiation of this entire process)? Were I to look at the initiation of an endeavor and try to analyze it, I would probably look at where it first began, not three steps in. But, again, a horary is certainly far more to-the-point. Different types of charts are used for different reasons. I have seen election charts used in significant events, such as time of death, moments where someone disappeared, etc., and those charts did sometimes end up with the ascendant representing the main person this happened to, but an interview involves many factors, and all of the people in the interview with you (the interviewers) are going through this event too, so it is not just special to you. In a way, it is also a time where someone is wondering if the person they are meeting is a good candidate for them - see what I mean? Thank you so very much. I have not studied Election charts so I did not understand where you were coming form so thank you for your clear and concise explanation. I too was wondering if I was choosing the best time to cast a chart for the question and you have made it clear that I have not. I did believe that I was wrong and I am glad you have made that clear to me. Interview over and I say it was a grand slam. This discussion reminds me of election charts for the sinking of the Titanic. Do we look at the initiation of the build, the first voyage, the moment the boat hit the iceberg? You will find election charts for each point but get different responses as to the energy that lead up to the moment this happened. And, again, you saying this was great for you doesn't really help other readers because a chart like this might be bad for them. We don't know your natal chart and can make no real analysis based off of only this chart for this particular topic. I am in a Mercury profection and Mercury is pretty much tied as my strongest planet, so if I had a time scheduled where Mercury was debilitated, I would expect it to be difficult and I would not be at my best. However, if someone has a less emphasized Mercury or other influences that are positive at this time, such as Sun trine Sun, Sun in the 10th, Jupiter trine Sun, etc., then that would more likely explain the good outcome than an election chart. If you are in a Venus profection, then Venus is highly dignified here, although in aspect with Saturn. Or you could be in a Saturn profection and here Saturn is doing great. I agree completely with Tanit3333, here. Election charts are not horary charts, especially for a multi-step process like finding a job. Rarely do people get the job at the first interview. Frequently, you have to sweat it out with various interviews. You should seriously re-phrase the question and ask a question: "Will i be offered the job at ABC company." Then, don't re-ask the question, again. However, IF you do get this job (and don't count your chickens before they hatch), the best election chart is made for the START of the new job, the moment when you first REPORT to work and walk though the front doors. The reason is even if you start the job, you can break your leg, get sick, or not show up, or even get a better job offer. However, every other election chart is meaningless ! Meanwhile, the progressed natal chart should say something, too, especially the secondary and solar arc progressions and current transits. Hold on Guy's. I understand what you are saying, but as my handle suggest's I am a complete rookie at astrology, thus why I am posting here for advice. So pilling on is not helpful. That said, I "Thought" I was asking a horary question and even questioned if I was asking the right question at the right time. I have been educated that I was not asking a horary question but rather a Electional question, something I have absolutely no idea about. So thank you for educating me and sorry for wasting space here. My tone is often misinterpreted due to autism. I also have Mercury trine Saturn in Virgo in the 3rd house, so I am told that I sound pedantic, when in reality I am just conveying the many thoughts that are over-analyzed in my head. Posted: Tue Feb 13, 2018 10:13 pm Post subject: Will I work here-New Job? ..delete.....delete....redundant Original post in February 17th did not get the job. "Omnia Numeris In Sita Sunt"
"Everything is veiled in number"
"Ye Stars which are the glory of Heaven!" No need to apologize, my friend. Just re-ask the question and post the chart. We will respond. We know how hard you have tried to find meaningful work, so obviously, you will be employed at some point. If not this time around, then next time. If you don't mind us asking, what type of work are you looking for ? I wasn't aware that you were autistic. Thanks for that snippet of info. However, I have to say that you are a very capable horaryist and I always look forward to your contributions on this site. I agree, you are very mentally sharp and detail oriented, which likely comes from that Mercury Saturn natal aspect as you say. People with natal Mercury and Saturn, in aspect, are likely lone wolf types and have a detective like mentality about them. They have difficulty trusting people? They usually have a very disciplined mind and are not easily deterred, as they have usually had many defeats in their own lives, typically with their family and/or brothers/sisters. If the square or opposition is involved, they are often estranged from their family, not always by choice but because they are treated unfairly or even abused. To Rookie: We do look forward to your future employment plans, no matter what happens from here on, in. Let's keep sending good energy your way, and one day, you will be happily employed. One way of dramatically increasing the odds of finding work is to step outside of the box? Such as, joining the local chamber of commerce and go to a free, once a month, social, where you can meet, in person, other members of the chamber, typically the managers of the businesses in your area ? In other words, you have to meet the future employer while the job position is still fresh in their subconscious minds, just as they are thinking about it ! By beating your competition to the punch, it ensures your employment in a "dog eat dog" world, where obviously, there are far more applicants than jobs. The other advantage to personal meetings with others is that, I think that e-commerce, in general, is highly over-rated and is mostly "b.s." You have to leave your computer, at home, sometimes, and just meet people, in the flesh, via prospecting. However, to maximize this approach, you have to strategically use election astrology to plan your job hunting events, making sure the ascendant and ruler is beefed up, the Moon must be fortified and well aspected and the 10th house and 6th house rulers must also be well aspected. Regarding your career, how is the ruling planet of your career working in your own natal chart? Are you flogging a dead horse ? Like many of you, I have a "career" and it goes well, as the ruling planet of that career is both angular and prominent. Therefore, it tends to attract attention and I typically win. The ruler of the natal house of money is critical, as well. Where does that ruler fall, in what sign and house, and what does it do to the rest of the chart ? Pay attention to these little things. It's not always what you want, it's what the universe prescribes. Also, the relocated natal chart gives many clues. What does it say ? The relocated ascendant, relocated MC, and relocated sixth house. Does it add to the overall natal theme, or take away from it. 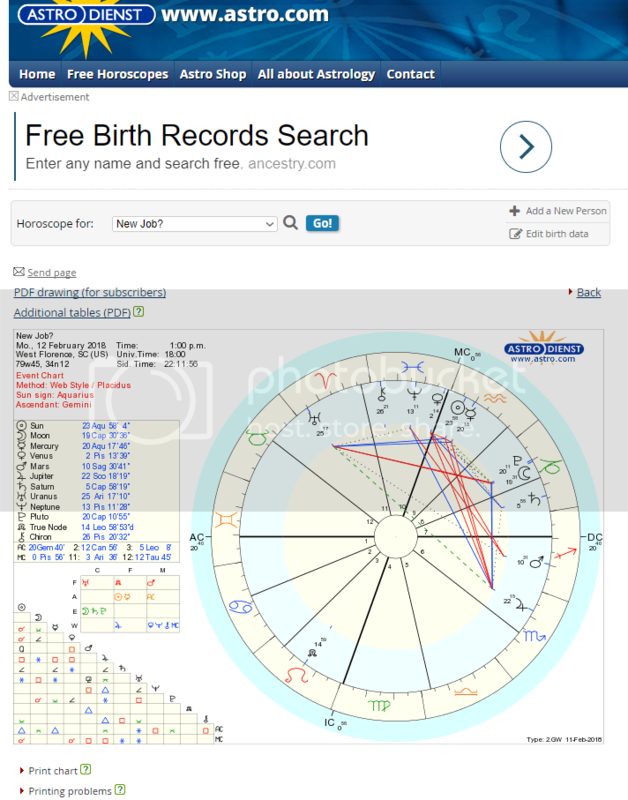 Look at the progressions and solar arcs to the relocated natal chart. They will be quite telling and revealing. Ok, Sabunim, per your request I have restated my query at the moment I received your request. I understand however that asking the same question over and over is not proper, but given your request, I think this is a valid Horary. So I asked the question, "When will I receive a job?" So this is about timing, which could also answer the question if the employer that I am in contact with will be my future employer. As i said previously, I thought the interview I had for Controller (Accounting) position went extremely well and I have received subsequent word that they will be scheduling me for a face to face interview next week. This is where Electional chart might be nice as I negotiate the timing of the in person interview. However, I am not adept at Electional so hopefully some of you can help me with that. I am not even adept at horary but here goes my thought on this new chart. I am moon in the 12th and Saturn in the 11th, employer is Jupiter in the 9th. Saturn and Jupiter are applying by Trine in 1.18 something. Saturn in Capricorn (Cardinal), Jupiter in Scorpio (Mutable) shows my sense of urgency and employer's sense of diligence. However, the speed at which employer is moving according to them is quickly, so I could see this timing as 1.18 weeks. However that is a bit too quick to show a start date, but may be an offer timing. As for anyone who wishes to attempt an electional chart for timing next week, I was born in Keene Valley, NY, 3/26/66 at 18:20. The interview will take place in Dillon, SC. Based on the horary chart that you have provided, (and assuming that you did not ask the same question, previously), I predict that there will be delays in obtaining what is being asked about. What I am seeing in this horary chart is an ambivalent outcome. You will find work at some point, it says, but it may not be with your current situation or current job application ? Therefore, a certain degree of perserverance, on your part, Rookie, will be necessary, here, the chart forewarns. Saturn is the ruler of the 1st house, ( hence ruling you, the querent) and receives an applying sextile from Venus, the planet that rules accountants, controllers. Meanwhile, Saturn is well placed in its own sign of Capricorn. The short answer ? Some very good news is coming your way ! Also, the co-ruler of the first house, (Jupiter) makes a mutual reception with Mars in the 10th house, so that means "opportunity" and career advancement. However, the ruler of the 6th house of employment (Moon in Aquarius) is found in the 12th house, not a great aspect for finding work. Further to this, the radix Moon is conjunct the south node, an aspect of unfortunate circumstances. The Moon is found in a cadent house, and in a fixed sign, also slows down things, it must be said. That said, Venus and Saturn make a seperation of 1 degree and change, so the earliest we can hope for in terms of employment is one week and a bit (not likely) or one month and a bit, but it could also be a one year wait, as the Moon is in a cadent house. Regarding your natal chart, your chart reveals, in career matters, cycles of growth and prosperity, followed by periods of famine and dark times. Isn't it true? That is signified by Jupiter, Saturn, Uranus, and Pluto, involved in a dynamic t square (a mutable t-square). Meantime, the proliferation of the 6th house is noteworthy, that makes you very VIRGO like ! You put all of your proverbial eggs in the job basket, but not so much in other aspects of life. Bottom line?, strive for a more balanced life. The cure for that, also, is to not limit yourself to one income stream, but to launch several streams, so that if one stream fails you, the other will sustain you ? Meanwhile, Saturn in Capricorn. by transit, squares your Libra ascendant and your natal Sun in Aries, that's NOT a piece of cake. So, I would caution you to be patient, at this time, and expect delays. You can be an impatient person, during the best of times, but you need to check your affairs and wait for better conditions ! Transiting Jupiter trine your natal Mercury (coming soon) should bring you some temporary work, but nothing comes easy at this time. One possible situation with t.Saturn square n. Sun is finding an employer who is too demanding, and or treats you unfairly, or is not suitable for you. Beware of "men" (or male supervisors) coming into your life at this time ! Finally, with Saturn transiting your 3rd house at this time, watch for mental depression and anxiety and combat that with wholesome activities, such as gym work, meditation, and or positive thinking. Something else. transiting t. Neptune will soon enter your 6th house of employment, so that brings its own challenges, such as office politics, backstabbing, and malicious gossip from jealous coworkers. If you have ever experienced those things, beware of it returning back in your life ! Again, good luck to you. Let us know how things work out.